Includes new sours flavors. 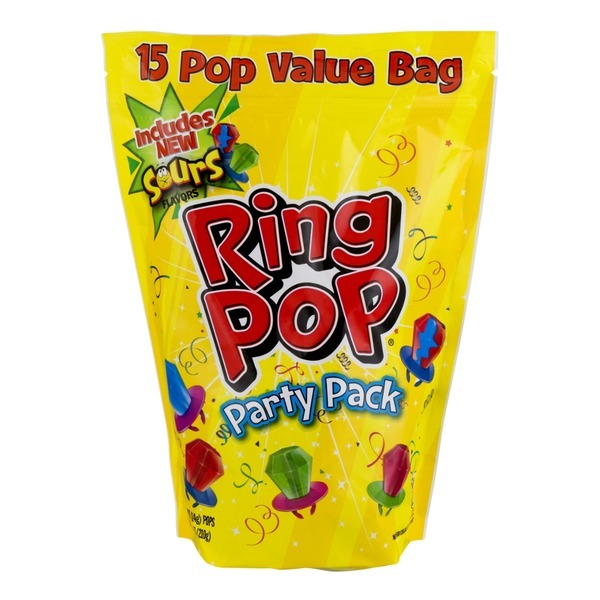 15 Pop Value Bag. 15 servings per package. 15-0.5 oz (14g) pops. 60 calories per serving. Ring Pop: All Flavors contain: Sugar, Corn Syrup, Buffered Lactic Acid. Additionally: Blue Raspberry: Artificial Flavor, Pear Juice Concentrate, Blue 1. Cherry: Natural & Artificial Flavors, Pear Juice Concentrate, Red 40. Strawberry: Natural & Artificial Flavors, Pear Juice Concentrate, Red 3, Blue 1. 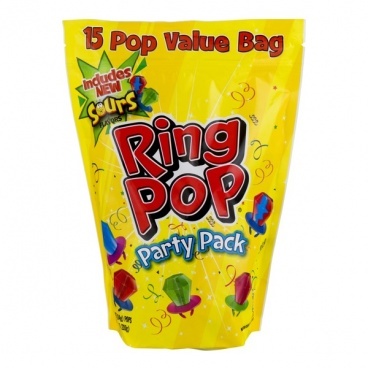 Ring Pop Sours: All Flavors contain: Sugar, Corn Syrup, Lactic Acid, Citric Acid. Additionally: Sour Cherry Berry: Natural & Artificial Flavors, Pear Juice Concentrate, Titanium Dioxide (Color), Red 40 Lake, Blue 1 Lake, Red 40, Blue 1. Sour Watermelon: Artificial Flavor, Pear Juice Concentrate, Turmeric (Color), Blue 1. Not for children 3 and under.